born in Caracas, Venezuela, currently resides in the US, where she has expanded her successful international career as a Visual Artist at her studio in Davie, FL. 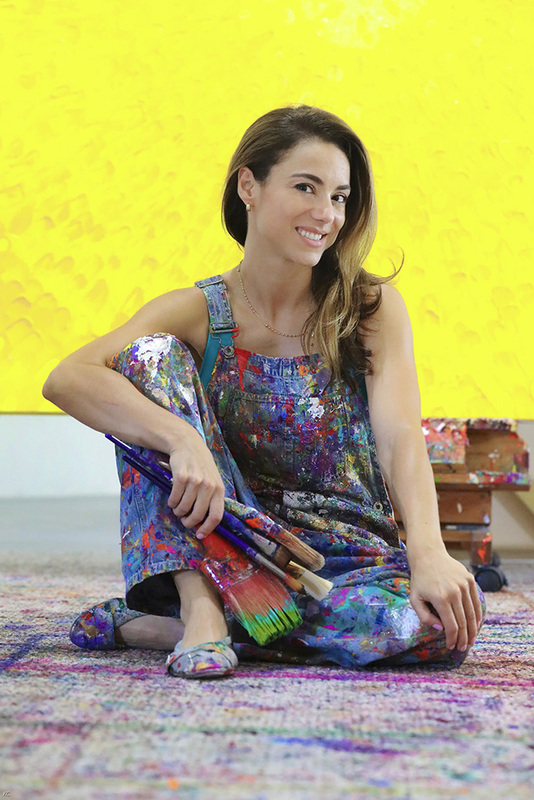 From early age, Valentina revealed her interest for the Arts, through her talent for painting and poetry, as well as by a love for music, which is today her central source of inspiration and a main media for her abstract paintings. Valentina says: “I decode the Music to then transform and code it as color. For me, the Music is not only an inspiration, it is the element from which all is born, it is the Artwork on itself, expressed in a different way. My Artwork is completed when I am able to bring the Music to a visual tangible dimension.” She also has said: “Music becomes my air, it is my driving force… I feel the music inside me, and my heart dances with each beat. The vibrations of each instrument dance in my soul, transferring the notes into my artwork… My work is a union of paint and music together into a harmonious symphony that makes my soul smile... My paintings carry a message of love, energy, bliss, absolute dedication, and passion. My artistic process is reflecting feeling and the emotion of music into artwork, and I transfer it into my work… I paint the music, bringing it from the abstract plane, to the concrete, to be visual and tangible… When I paint, time and space doesn’t exist for me.” Her rich textures are fearless, pushing the limits of two-dimensional painting, as pigments and layers create a noticeable physical and psychological depth. A diverse color distinguishes each one of the Artworks by Valentina Bilbao that through the years have captured new dimensions and artistic styles. Although if the use of a spatula has been her most characteristic skill, today Valentina creates her one of a kind pieces cleverly including on them a dripping technique. The circular form is a key characteristic in her Art for suggesting expansion, birth, cosmic creation, and movement that is also represented by waves. Her Artworks are intense, as it is her ardent happiness to communicate her love for Life, Nature, Humanity and Enlightenment. The Art by Valentina Bilbao represents a New Renaissance for this Millennium, as she is an Artist that wants to leave an influential perdurable statement for her time and for the generations to come. Her positive discourse is about betterment and she proves it by improving her Art with new techniques, shapes and materials, in addition of being always aware for novel themes and concepts. Her Artworks can be very large, as it is the greatness of her heart. Her relationship with Nature is evident in her paintings, as they show a great light, or connect with water or land, or even when they are totally made of a black color paint, they shine due to the thickness of the textures created by the spatula that project the lights existing around. On a comment about the life and achievements of Valentina Bilbao, it is interesting to highlight that from an early age, in the 90’s, at the same time that she was developing her Artistic career attending drawing and painting classes at the Ateneo de Valencia, she pursued to transmit her skills to the younger generations, creating “Pinceladas” Drawing and Painting Workshop in Valencia, Venezuela. Later, to complete her University education, she attended the Instituto de Artes Plasticas Arturo Michelena and studied Child Psychology, both in Valencia, Venezuela. Among her recent shows, in 2018, Valentina exhibited at the Art Museum of Boca Raton and at Art Palm Beach, both in Florida; in 2017, at “Personal Structures: Open Borders” during the Venice Biennale, Italy, and at Art Wynwood, Miami, FL; in 2016, at Boca Raton Art Fair, FL, Scope NY, NY, and Art Wynwood, FL; in 2015, at Aqua Art Miami, FL, and in the exhibits with Curators Voice Art Projects: Premium Art Basel Season 2015, SALON 2015/JURIED SHOW – Wynwood Art Districts, The Softline, and Silence, as well as in Contemporary Perspectives at Agora Gallery, and ArtExpo NY – Pier 94, both in New York, NY. She received important Awards, among them: the Leonardo Da Vinci 2016, Florence, Italy; the Salon 2015 Juried Show First Place in Painting at Curator Voice Art Projects, Miami, FL; and in the years 1993, 1994, 1995, the First place Poetry, Santa Cruz, Valencia, Venezuela. The Art by Valentina Bilbao is part of significant Collections in the US and abroad.